Amazon's Cashier-Less Seattle Grocery Opens To The Public : The Two-Way The store, which has been open only to Amazon employees for the past year, uses a smartphone app and a network of cameras to track a customer's purchases. 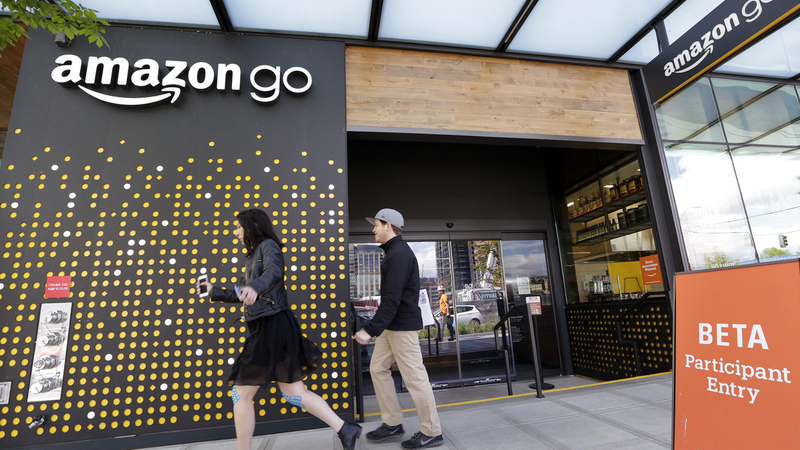 Shoppers roam through an Amazon Go store in April. The automated grocery, which had been restricted to Amazon employees, will be open to the public starting Monday. Amazon on Monday will open its automated grocery in Seattle to the public, replacing cashiers with a smartphone app and hundreds of small cameras that track purchases. For the past year, the 1,800-square foot mini-mart has been open to the company's employees. People walk past an Amazon Go store in Seattle in April, when it was open only to Amazon employees. 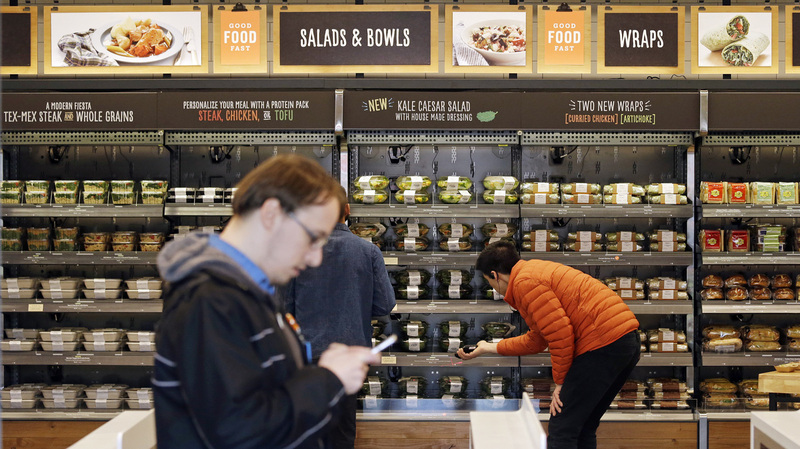 There is no waiting in line for check out at Amazon Go, as the store is called — instead, its computerized system charges customers' Amazon account as they exit the store. "Every time customers grab an item off a shelf, Amazon says the product is automatically put into the shopping cart of their online account. If customers put the item back on the shelf, Amazon removes it from their virtual basket. The only sign of the technology that makes this possible floats above the store shelves — arrays of small cameras, hundreds of them throughout the store." The stores have no carts, either — just bring your own shopping bag. Amazon has dubbed the technology "Just Walk Out" and, according to CNBC, "it uses computer vision, deep learning algorithms and sensor fusion — many of the same advances being used to develop autonomous driving." In August, Amazon announced a $13.7 billion deal to acquire Whole Foods, giving the online retail giant a firmer foothold in the grocery business. Amazon says it has no plans to implement its "Just Walk Out" technology in Whole Foods.